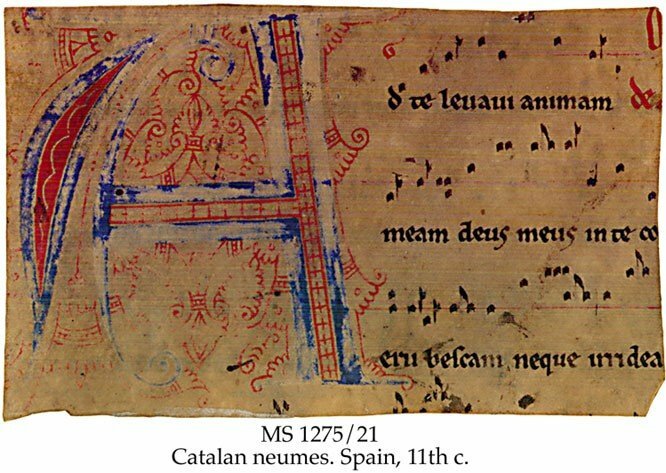 Description	 MS in Latin on vellum, North Spain, 2nd half of 11th c., 1 partial f., 8x13 cm, part of 1 column, (8x13 cm remaining), 3 lines in Carolingian minuscule, 4 lines of Catalan neumes on a single-line red F staff, a large, 7x7 cm, initial A in blue and red with red flourishing. 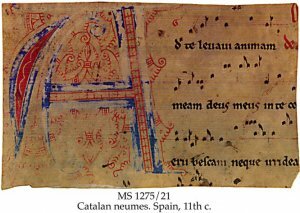 Context	 Inserted in the Le Moine palaeography handbook, MS 1275/01. Provenance	 1. Cathedral of Toul, Lorraine (2nd half 11th c.-1761); 2. Pierre-Camille Le Moine, archivist and secretary of the cathedral of Toul (1761-1789); 3. M. le baron de Tremont, no. 1253; 4. M. Marchant, Saint-Mihiel; 5. François-Jean Baptiste Noël, Nancy, no 6205 (-1856); 6. Bruce Ferrini, Akron, Ohio.